At our reception. Address: Koornmarkt 72, Delft. Can I check in before 15:00h? Our check in is from 15:00 at our reception on the Koornmarkt 72. An early check in is possible if the apartment is ready before. If not, you are able to leave your luggage at our reception until check in time. Can I check in after 22:00h? If you would like to check in later that is no problem. Please inform us of your arrival time. Then call 15 minutes before arriving to our reception to avoid waiting. You are able to contact us through: +31 831 777 09. Please note that check in before office opening hours and after midnight are not possible. What do I need to pay during the check in? If the payment has been arranged before arrival we will only need your credit card to verify the name and card number. If not the total amount of the reservation has to be paid at check in. Please keep in mind that during the check in we will require a valid ID (or driver license) and the credit card which was used to make the reservation. For our planning we would very much appreciate if you could inform us with your estimated time of arrival. Luxury Apartments Delft takes care of the bed linen and towels in the apartments. You are free to bring food an drinks in the apartment. Please note that LA Delft operates with a non-party policy as described at Artikel 7 in the terms and conditions. Luxury Apartments Delft offers possibilities to make your stay even more remarkable. 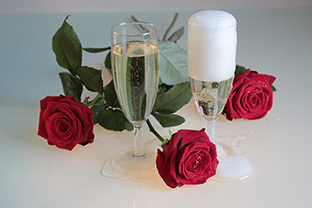 Surprise the one you love with a bottle of champagne or roses petals on the bed. For more information and prices please call: 0031 683 177 709 or write an email at info@ladelft.com.